Most therapists will be familiar with the individual therapy model which is the most common form of therapy in private practice. Individual therapy is a one to one relationship between the client and the therapist. This singular relationship allows the therapeutic alliance to develop based on specific connections between client and therapist. It also provides a quicker process by which the client can explore their own personal issues with focused attention from their therapist. In individual therapy, the therapist is able to provide focused treatment that benefits the client specifically. This is important if the client is in crisis. Individual art therapy is also more suitable for clients who have experienced trauma that is associated with high levels of shame. For clients who are feeling shame and embarrassment, the ability to undertake therapy in a private, safe and confidential space will facilitate more engagement with the client who can feel safe their story won’t be judged by other people that might be present in group therapy environments. Individual therapy requires motivation and focused attendance from the client who may otherwise hide amongst other people in a group setting. Attending individual therapy can present as a gateway to group therapy for the client at a later date. Individual sessions may initially introduce art making and therapy to the client so that they can move into a group setting with more confidence. From a practical point of view, individual sessions provide the client with the ability to attend therapy sessions at a time that is solely convenient for themselves. This increases the likelihood of the client attending each session when they have control over the session dates. Group therapy reduces the one to one ratio of client and therapist contact, however, it delivers additional benefits from the group dynamic. Individuals who participate in group therapy can see there are others who are experiencing the same problems, emotions, and situations as themselves. This can help the individual client feel less isolated by seeing that others understand their experience. While the development of the therapeutic alliance is often not as direct or quickly established in group therapy, the addition of other people in the group expands the ability of the client to develop secondary therapeutic alliances with other group members. Clients will receive support from other members of the group as well as be given the opportunity to provide support to other members of the group. This exchange of support helps establish a framework for giving and receiving with other people in a well supported environment. The opportunity for open discussion within a group environment can be beneficial for a client as they can be encouraged to participate based on the interactions of other members who express similar thoughts and emotions. The dynamic of a group of people can provide a feeling of safety for clients who feel intimidated by the intimacy of individual work where the focus is solely on the individual client. Group therapy provides an opportunity for each individual to gain a broader perspective of their individual problems in context with how other people are facing similar circumstances. This understanding may help the client by showing they are not alone in their experience. The client may also be inspired by other group members who have progressed to stages that the individual aspires to work towards. From a practical point of view, group therapy allows the therapist to help a larger number of people compared to individual therapy. The ability to help a larger number of people in group therapy may be critical to an individual member who might otherwise have been unable to attend individual sessions due to cost and the availability of a therapist. There are downsides to group therapy which may affect the progress of your client. Your client may feel intimidated by other personalities that are more outgoing and use this opportunity to avoid exploring their own issues. In this instance, the client will not receive the attention they would receive in individual therapy that might help them confront their avoidant behaviour. Group therapy settings can also be problematic for maintaining confidentiality amongst participants. Confidentiality and respect for other members opinions should be addressed at each session as a reminder to all participants of the group. From a practical point of view, groups can be more difficult to organise in terms of scheduling a time that suits all participants. 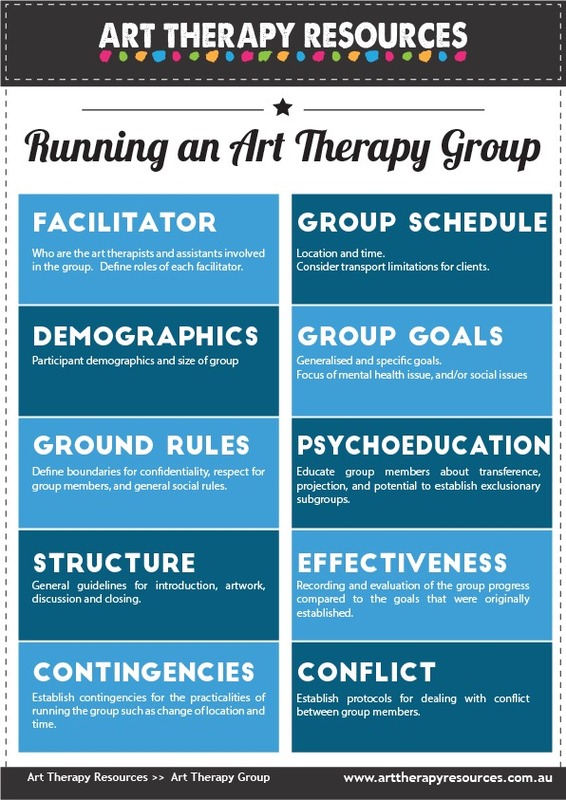 Additionally, therapists need to provide the necessary resources for art therapy supplies on a larger scale to accommodate all participants. Open studio – each individual work on their own projects at their own pace. The setting is informal and the art therapist has discussions with each individual separately without a group discussion. Theme based – the group meets to address specific issues or experiences such as grief, anger or divorce. This therapy is usually conducted in a shorter time frame to address a specific issue. Group analysis – this style is an extension of the open studio style. The approach to art making is open, however, group discussions occur. Group interactive – in this group the dynamics of the group is an integral part of the therapy process. This style is a mix of theme based and group analysis. The interaction of the group forms part of the discussion process. Art based social issues – this style is an extension of the theme based group style and focuses on a social issue that the group may be facing. Examples include asylum seekers, natural disaster victims, and religious groups. Group facilitator – who are the art therapists and assistants involved in the group. Define roles of each facilitator. Group schedule – location and time. Consider transport limitations for clients. Group demographics – participant demographics and size of group. Group goals – generalised and/or specific goals. Focus of the mental health issue, and/or social issues. Group rules – define boundaries for confidentiality, respect for group members, and general social rules. Psychoeducation – educate group members about transference, projection, and potential to establish exclusionary subgroups. Group session structure – general guidelines for introduction, artwork, discussion, and closing. Group effectiveness – recording and evaluation of the group progress compared to the goals that were originally established. Contingencies – establish contingencies for the practicalities of running the group such as change of location and time. Conflict – establish protocols for dealing with conflict between group members. Some of the issues you need to consider in a group setting are the diversity of the group demographics. This demographic diversity refers to race, culture, gender, age, disability, health, and religion. From a social psychology point of view, individuals will connect with group members who best resemble their own demographic. This is evidenced by women’s groups, elderly groups and religious groups that identify with like minded individuals. As individuals, we can benefit from exposure to other people with different backgrounds. When individuals with demographic differences gather together to bond over similarities in circumstances, a bond can form that will help facilitate the therapeutic alliance amongst group members. This has occurred where communities have experienced a natural disaster such as floods. Conversely, depending on the circumstances, bringing together a cross-sectional group can also be detrimental to the group cohesiveness and functionality. In the case of sexual abuse victims, it is best to define groups based on age appropriateness given the level of discussion around traumatic events. While group therapy can serve as a space to broaden understanding and awareness, it is not the place to experiment with group dynamics and inquisitively observe the interactions of group members. As a therapist, you should use your discretion when forming groups and referring clients to attend group therapy. 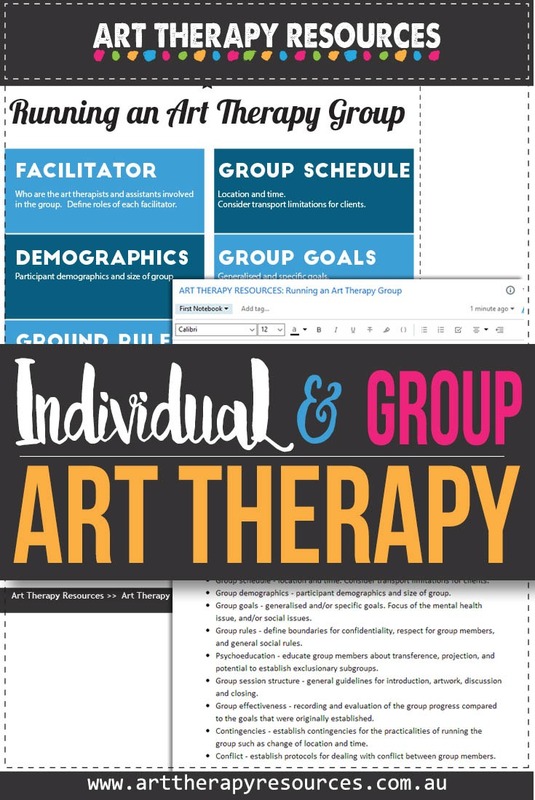 SIGN UP below to download the FREE Group Art Therapy summary checklist of areas to consider when setting up your own art therapy group.